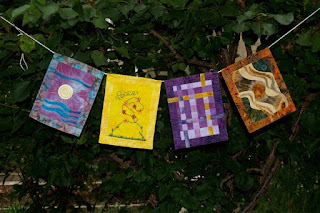 In 2012, a group of Albuquerque artists used the medium of the apron to express themes from women’s lives, struggles and history. The Apron Project was an outdoor installation in downtown Albuquerque, NM during March 2012. Another such exhibit is planned for March 2013 to be displayed at the National Hispanic Cultural Center. If you would like to submit an apron, or contribute in any way, please go to their website WomynsWork or their Facebook page for more information. Happy New Year to you! The Bhavana Project's third set is still in progress with the last flag being worked on. 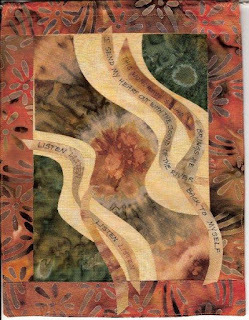 While we wait, let us revisit the beginnings....please enjoy the lyric, flowing flag made by Sigrid Wagner in August 2009. The words are: "This wonderous sound brings me back to myself. I send my heart out with the sound of the river. Listen Listen Listen Listen"